If you can count on Japan for two things, it’s (1) having cell phone technology that will finally arrive here in the States about the same time as “green” cars that run on apple juice and cat farts, and (2) inventive (i.e., fuggin’ weird) new fetishes and ways to capitalize upon them. In fact, just this week, news came out that a Japanese online lingerie retailer’s latest best-selling product is a bra for men. 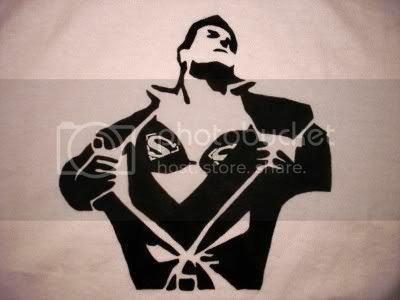 Etsy user nontrendy, who knows a burgeoning trend when she sees one, created this hand-stenciled t-shirt print of Superman exposing his Supermanzier. A clever parody. Meanwhile, you know there’s actually a dude running around with a Hello Kitty man-bra under his suit, right? I mean, it’s practically a given. Thanks to Fashionably Geek for the find. Oh, man… my friend who’s got that (minus the bra!) for a tattoo is probably going to choke in her cereal bowl this morning. LOL! Don’t feel too bad about Japanese cell phone tech. They’re all the size of shoe boxes, for some reason, and everyone (including men you wouldn’t peg for the Hello Kitty bras) attach about 9,000 jangly charms to the phones. So really, it all evens out. Sorta. @Nathan A manssier, if you will. Previous post: Geek Steal: 65% off Buffy The Vampire Slayer – Collector’s Set!